Switzerland. Home to The Alps. A formidable mountain range that includes Monte Rosa as it’s highest peak and the Eiger, the Matterhorn, the Jungfrau and a whole host of other ‘horns’ too numerous to list. Standing on our balcony we are able to see (on a clear day of course) the three peaks of the Eiger, Monch and the Jungfrau nestled between our local ‘hill’, the Rigi, and our local mountain, Pilatus. Mount Pilatus has legends of ghosts and myths of dragons (more of those later), oh, and even has a radio station named after it. Pilatus was to be the destination of our first mountain trip. I have to confess though that we were not going to climb the 2,132 meters of hulking rock face on foot. 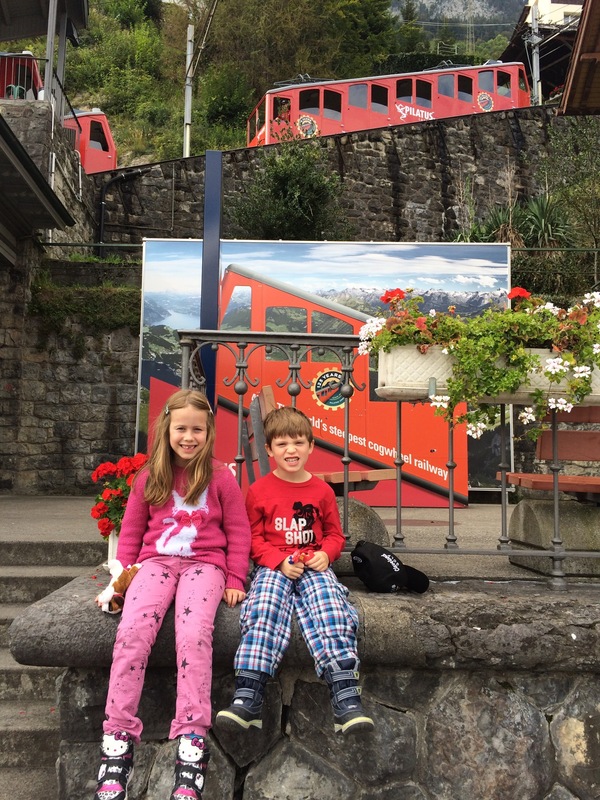 Nope, sorry to disappoint you, but instead, we were going to ride the world’s steepest cogwheel railway to the top! Yes, I know, far more exciting, we were going to travel at an angle of 48 degrees. First stop – ticket office, unsurprisingly I am going to have another mini rant over the cost of EVERYTHING in Switzerland. For the three of us (Joshua, being under 6, travelled free) to go to the top of Mount Pilatus and back down again we were charged a whopping 170CHF! The total time of the ascent was going to be 30 minutes and the descent 40 minutes. I have to state this because it is the only way I feel vaguely alright about the cost because it means that it ‘only’ cost 2.42CHF per minute spent on the train, for some reason this seems a little bit more reasonable. I know that I mention the cost in every To Do blog post, and I know that we are luckier than most, but with so much to do and see in this beautiful country it is a shame that regular outings such as this are becoming cost prohibitive. We did, however, have plenty of time to get over the shock of the cost (I really must start looking at these things before we leave the house) as it was 20 minutes until the next train was due. We joined the queue and spent the time trying to hold our place in it. The Swiss don’t wait patiently in an orderly line like us Brits. I felt, by turns, like a sheep being herded into a pen, a rugby player in the middle of a scrum and a groupie at the front of a 1D gig. When the train did turn up I feared that we would even get on it as we’d been squeezed so far from our original standing place. Happily we did manage to clamber aboard and spent only half of the 30 minute trip recovering from the mob queueing tactics (honestly, the opening of a Primark store would have been more civilised). Once at the summit there are a variety of walks to reach the three peaks of Pilatus (Tomlishorn, Esel and Oberhaupt) from which you can enjoy the views. There are even two hotels in which you can extend the experience. Unfortunately the views were not particularly spectacular on the day that we went. Well I say that, but what I really mean is that we couldn’t see much of the world below us. The mountain clouds obscured pretty much everything that was more than 50 feet down. Looking out across the sea of marshmallow clouds was truly spectacular, lending an otherworldly ambience to our adventure. This is just like Glastonbury Tor. Also a little cold, so down we went to find out more about the myths and legends that shroud Mount Pilatus… The Roman governor, Pontius Pilate (ah yes, him of Jesus crucifixion fame, and from whom the mountain gets its name) is alleged to have been laid to rest in Lake Luzern, at the foot of the mountain and that his restless soul rose from the water every Good Friday and caused terrible storms. In the 16th Century a priest from Luzern, and some locals, climbed Pilatus and challenge the ghost, but there was no reaction to the mob and so they believed that the ghost had been seen off. Since that day there have been no more storms on Good Friday. There are said to have been dragons living on Pilatus, but only good natured, helpful dragons, you’ll be pleased to hear. Consequently you now can’t go to the mountain without seeing Pilu everywhere (modern marketing loves a friendly drago!). Pilu-land, an adventure park for children, is located half way down the mountain where ankle biters can do battle or make friends with Pilu as the fancy takes them, after all who doesn’t love re-enacting a bit of Sir Charlie Stinky Socks? For us though that will have to be an adventure for another day. Around the summit there is the Dragon Walk which follows a tunnel through the northern side of the mountain with plenty of windows to spot dragons from, and information points about the dragon myths that accompany Pilatus. The best thing though is that it took relatively little effort to walk round and we were able to finish off with a lovely bottle of red from the hotel whilst sat on deck chairs looking out over the clouds before descending at a gradient of 48 degrees back to earth. Disclaimer, all opinions given in this article are mine, I received no money in exchange for this review. Prices are correct as at September 2014.